In tracing the evolution of marketing consumer products using comics characters, encountering Marge Buell and her moppet creation Little Lulu is inevitable. Jennifer Gotwals examines Buell’s archives to find the businesswoman behind the drawing board. Marjorie Henderson Buell—“Marge” to her fans—was more than the creator of Little Lulu; she was one of the first American cartoonists to retain copyright to and licensing control of her characters. In a past issue, Hogan’s Alley detailed Little Lulu’s move from a one-panel cartoon to multiple-panel narratives, and into multiple media and memorabilia as well. An exploration of Buell’s personal and professional papers, recently given to the Schlesinger Library on the History of Women in America at Harvard University’s Radcliffe Institute for Advanced Study, provides insights into Buell’s business practices and decisions that contributed to Lulu’s meteoric rise in popular culture. All told, the Marge Papers at the Schlesinger date from 1856 to 1994 (they include some of Marge’s family’s history as well as her own) and include comic books, correspondence, business contracts, scrapbooks, original artwork, clippings of Kleenex ads, a complete run of the Little Lulu syndicated strip, fan letters, early drawings, films of Kleenex advertisements, Lulu products and product advertising, report cards, yearbooks, published cartoons and photographs. These historical documents and artifacts will allow researchers to study Marge’s long career as a cartoonist, her different types of drawings and humor, Little Lulu’s meteoric rise to the heights of Times Square billboards and the behind-the-scenes deals that raised her there. Not much of Marge’s outgoing correspondence survives. However, in some cases, her handwritten notes or drafts for letters appear on the backs of correspondence to her. These give an idea of the first draft (if not the final one!) of her ideas regarding Lulu and her career. Buell’s lack of interest in personal publicity seems to have shaped the way her business model developed. Buell was very involved with the legalities and details of the product licensing agreements she signed, but she chose to work mainly through two intermediaries: her lawyer in Philadelphia, Howard E. Stern, and her licensing agent in New York, William Erskine. Only some of what must have been voluminous correspondence between the three survives, but what is left tells an interesting story of Marge’s business acumen, interest in Lulu’s legacy and personal feelings about her life’s work. Buell tended to give stock answers to published profiles and interviews. Only two or three photos of her—the last one taken in the early 1940s—appear in press coverage throughout her life. After 1944, when Lulu last appeared in the Saturday Evening Post, Buell became even less interested in the public spotlight. Throughout her career Buell remained surprisingly blasé about interviews. She often turned them down, even against her licensing agent’s advice. It seems possible that some of Buell’s lack of interest in the spotlight, particularly after Lulu left the pages of the Post, stemmed from her increasing responsibilities at home. She drew a Little Lulu cartoon for the Post every week beginning in February 1935. In 1936 she married Clarence Addison Buell; their sons, Larry and Fred, were born in 1939 and 1942. There is little to be found, either in published sources or within her papers, that addresses Buell’s own feelings about her artistic work and her work as a wife and mother. However, her decision to form a team to help manage the popularity and licensing of Little Lulu speaks to her realization that she could not convincingly be both an artist and businesswoman at all times. “In 1943, Mr. Richard Murray of Paramount Pictures contacted me about using Little Lulu and her pals in Technicolor animated cartoons. The Saturday Evening Post was very pleased with the idea and so was I. So I contacted a Philadelphia lawyer who was recommended to me as being very experienced in drawing up contracts. “I drew some character sheets of Little Lulu and went to New York to visit Paramount Famous pictures. There I met Mr. Sam Buchwald, head of the studios. Mr. Murray and Mr. Morgan were there also. An interesting tour of the studios gave me an understanding of how animated cartoons were made. While Buell was drawing Lulu for the Post, several merchandising agreements had been signed. Buell signed with an agency to represent her in foreign uses of the character and profited from a series of books that reprinted the Post cartoons. In addition, the Knickerbocker Toy Company made a Little Lulu cloth doll, which the Post used as a promotional tool. As noted, Buell negotiated the contract with Paramount in the spring of 1943 with the help of Stern, but later that year she engaged Erskine to represent her in the negotiations for the Kleenex ad campaign. These two initial large contracts were somewhat different from the later numbers of small merchandising contracts signed and also required yearly renewals, an exhausting process. Buell and Erskine signed their first contract on Nov. 22, 1943. That fall, Erskine had been instrumental in negotiating a contract for Buell to draw Little Lulu for Kleenex advertising campaigns. This first contract states that Erskine “has agreed to use his best efforts to negotiate agreements for the granting of such licenses and rights by the party of the first part [Buell]” and notes that Erskine “will at all times foster and maintain the high standard of the character LITTLE LULU and associated characters.” He was granted the exclusive right to represent Buell and Lulu (although Buell pointed out years later in a letter to Stern that Erskine had never been required to represent them exclusively). Buell stipulated in the contract that she would not draw or produce anything specifically for any deal negotiated by Erskine and that she would have the final say in any licensing agreement. All contracts were to be drawn up by Buell (or, actually, her lawyer) and all payments were to be sent from the companies to Erskine, with a duplicate statement sent to Buell. Erskine would then take his cut of the profits and send the rest on to Buell. Erskine’s potential earnings were substantial: 50 percent of most royalties for the first year of a merchandising contract, and 25 percent in subsequent years. The contract between Buell and Erskine was for only one year but could subsequently be renewed every year for the next 10. The terms of the contract between the two would be constantly revised until they ceased working together in 1972. Under the terms of Buell’s first contract with Paramount, she was to be paid a lump sum of $500 for each Lulu cartoon created ($5,826 in 2006 inflation-adjusted dollars), and then would receive 5 percent of the profits above that sum. This made the venture—generally a departure from what she was used to—less risky for her: Even if the movies were unprofitable, she would receive payment up front for the use of Lulu’s name and image. In any event, this was a lot of money to make from a use of Little Lulu in which Buell was not required to do any artistic work. The agreement for the Kleenex advertisements was similar but did not, of course, include a profit margin. Buell was to earn a flat $600 for each Lulu Kleenex advertisement she drew ($200 of which would go to Erskine; in 1949, a revised contract gave a flat 33 1/3 percent of all Kleenex revenue to Erskine, a slight improvement for him). Initially Buell was to produce 13 Kleenex ads a year. In 1947 she agreed to draw additional artwork, which was to appear in outdoor posters, car cards, bus cards and subway cards, for a flat $3,000. Letter from Foote, Cone & Belding, Kleenex’s ad agency, regarding Marge’s drawings. “We want Mrs. Buell to submit the art for each frame separately; we will assemble here. It is not necessary for her to draw in any of the blurbs; they will be handled on an over-lay. The size of each illustration must be made to accommodate the width of the frames of the 1/3 page layout, and the depth of the ½ page layout. “In the third frame (Jumps Up) please be sure the figure of Little Lulu is complete. “The figure in the steam cabinet (fourth frame) should definitely be ‘skinny’ from too much steam. The face, however, should still be the little ‘fat’ girl. The ‘Balloon face’ can certainly stand with much improvement over the illustration in the layout. While Buell’s reaction to this sort of direction does not appear in her papers, it is hard to believe she would have responded well to that kind of criticism, especially after spending so many years drawing her own ideas. In her later years, however, she remembered enjoying the Kleenex work because it was so different from the silent one-panel comics in the Post, and she claimed that fitting the drawings to a narrative was fun and challenging. The total of the income listed here translates to $613,845.24 in 2006 dollars. Much of this was shared with Erskine (one-third of the Kleenex income and from one-quarter to one-half of the other income) but a substantial figure remained for Buell. Ad and tag from Lulu likeness on Footease loafer socks. From a scrapbook in the Marge Papers. played that part in terms of communications with licensees and the media. In an Oct. 30, 1961, letter to Buell about a news story to run in the Toronto Star, Erskine mused, “Now I suppose we shall have to try to proceed to what business calls ‘corporate image.’ We should try to think of how we want to convey to the public a concept of Marge today.” Part of the image he wanted to convey was Buell’s personal attention to every product. Buell stymied this sort of “corporate image” by refusing to give an interview to the Star. She did give a lot of attention to the Lulu products but registered her satisfaction levels through Erskine. Ad placed by Erskine in Playthings magazine in September 1944. For the first 15 or so years of their business partnership, Buell and Erskine seemed to have a relatively cordial and easy relationship. She usually wrote to him directly on matters of finances and royalties and communicated through Stern on matters relating to contract or other disputes. Beginning in the late 1950s, Buell and Erskine’s relationship, as well as Buell’s attitude toward her career, can be seen to shift somewhat, fueled by Buell’s feelings that Erskine was trying to push her toward more financially risky undertakings. After Lulu stopped appearing in the Saturday Evening Post in 1944, Buell continued to draw her only for the Kleenex ad campaigns; other cartoonists drew all other Lulu work (including comic books and comic strips). When Lulu’s run as Kleenex spokescharacter ended in 1960, Buell’s career as an active cartoonist ended as well. By this time, Buell was clearly beginning to think about the eventual sale of Lulu, as the 1960 contract between her and Erskine made clear. “With respect to the situation which might arise by reason of a sale or partial sale of the cartoon character of LITTLE LULU or Associated Characters: While such sale is not presently contemplated, should such a situation occur, it is our intention to arrive at an equitable adjustment in view of the circumstances then existing.” This contract also specified that Erskine was to receive 50 percent of any income from any new Lulu films. Buell at the drawing board drawing Lulu in Paramount’s New York studios, but other than drawing character models, she had no part in creating the animation or the storylines. Erskine, who depended on Lulu’s income for his entire well-being (Buell at least had her husband’s salary as well), was clearly intrigued by the licensing opportunities film and television offered Lulu. In the late 1950s, he brokered a deal whereby the original Paramount Little Lulu films were shown on television. After the 1960 contract guaranteed him more of the profits from such a deal, he stepped up efforts to create new Lulu films. By this time, Lulu’s value as a money-making character had lessened somewhat, and Paramount would only agree to a different type of contract. In a 1961 contract with Paramount, Buell and Erskine each agreed to put up $3,500 (half of the projected cost of $14,000) for the production of a color animated short cartoon. This film would be theatrically released and would also be used as the “nucleus [or pilot] film” for “a series of television programs, entitled LITTLE LULU PLAYHOUSE.” After Paramount recouped its initial $7,000 investment, it would keep 40 percent of all profit and split the remaining 60 percent of profit in half with Buell and Erskine; in essence, Buell and Erskine would each receive 15 percent of the net profits of the film in theatrical release. They were then to receive (to be split between them) 5 percent of profit for each television episode and a flat $1,000 for the use of the pilot film. The original plan called for the production of the initial film plus 39 half-hour shows. However, only two films were made, both went into theatrical release, and no television program resulted. One of many Lulu gags involving libraries. Strip from January 30, 1958. From Chicago Tribune News Syndicate. This contract for “Alvin’s Solo Flight” resulted in a considerable outlay of money by Buell, the only time she entered into such a deal. It only netted her $2,367.79 between 1961 and 1971, not even a recoup of the initial cost. “Frog’s Legs” never made her any money (although she did not have to lay out any money for that film). The entire deal also made her increasingly wary both of Erskine and contracts that varied too much from the standard of the last 15 years. Two-page letter from Erskine to Marge quoted in the article. The letter describes Erskine’s idea of how Lulu/Marge should be marketed. A hand-written draft of her reply is on the back (click to enlarge). Publicity photo taken by Paramount in 1943 and used to announce its first Lulu cartoon. The Little Lulu syndicated daily comic strip ended in 1969, and Erskine’s health had declined as well. Both Stern and Buell were nearing retirement age; their correspondence in this time period begins to center more on their trips to see their grandchildren than on business matters. In 1971, Buell and Erskine initiated discussions with Western Publishing, the long-time publishers of Lulu comic books and other products, about the sale of Little Lulu to them. Erskine was too sick to take part in negotiations himself, so his college-age daughter took his place. Negotiations went on for several months. 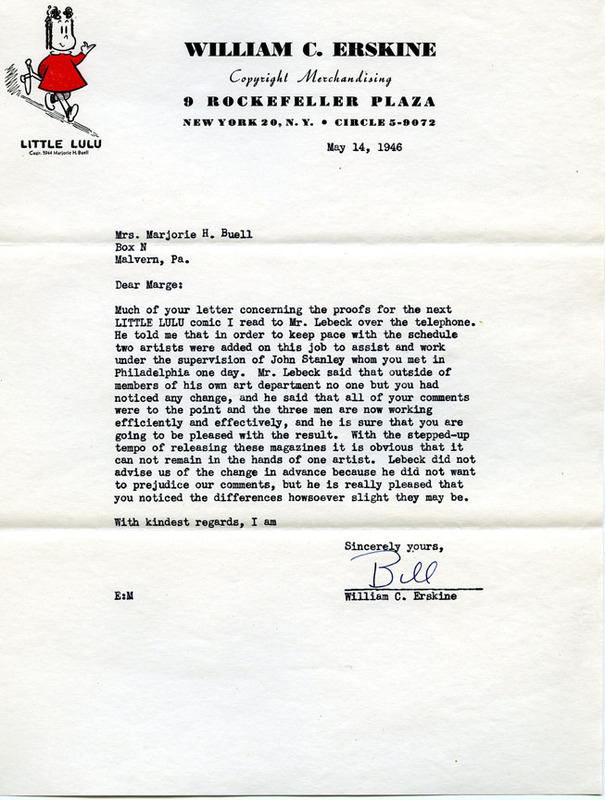 The agreement signed Dec. 24, 1971, by Buell, Erskine and Western Publishing states, “Buell and Erskine mutually desire to sell and assign to Western all rights without limitation or exception in and to the LITTLE LULU CHARACTERS…” In keeping with her interest in controlling Lulu’s image, Buell included the following clause: “Western recognizes the unique status of LITTLE LULU and associated and subordinated characters as copyright cartoons presenting a high level of entertainment and originality, disassociated from vulgar or crude ideas or unworthy products and agrees that future uses of the characters shall conform to said standards to the best of its ability.” Buell and Erskine received $99,000 for the sale, paid over eight years. After the sale, Buell retired with her husband to Ohio, where her oldest son, Larry, lived. In 1982, a museum exhibit celebrated her art and the continued cultural popularity of Little Lulu. Buell died in May 1993. Judging from the warm response to the availability of Marge’s papers, and the interest in a small exhibit about her life and work (from September 2007 through March 2008) at the Schlesinger, both Marge and Little Lulu continue to intrigue and inspire cartoonists and cartoon lovers alike. Editor's note: All documents mentioned above can be found in the Marge Papers, MC 554, Schlesinger Library, Radcliffe Institute, Harvard University. All quotations and images reproduced from the Marge Papers, Schlesinger Library, Radcliffe Institute, Harvard University. A description of and index to the collection are available at http://nrs.harvard.edu/urn-3:RAD.SCHL:sch01138. Note: This article originally ran in Hogan's Alley #16 (cover at left). To purchase a complete, high-resolution digital facsimile of the sold-out issue, click here.